The front of the 2009 Stand Still Parade. Photo courtesy of Tammy Hughes. Fifteen years ago the hundred-odd residents of Whalan, Minnesota, decided they wanted to host a parade. “Everybody loves a parade, and we wanted to do one too. We were just geographically challenged,” said David Harrenstein, owner of the town’s Aroma Pie Shop, in an interview with CBS News in 1995. Recognizing that Whalan’s block-long downtown was prohibitively short, Harrenstein and friends came up with a novel solution: “We decided that we’d set up a parade in the middle of town and let it stand there and have the audience walk by,” he told CBS correspondent Bill Geist. In the decade-and-a-half since, the annual Stand Still Parade has become an institution, garnering national media attention, and in effect, putting Whalan on the map. These days, the event attracts approximately 1,500 visitors, a huge influx of people for a town that now numbers a mere 35 registered voters. But during that same period, the future of the parade has periodically been called into doubt, thanks to a dwindling pool of volunteers, and dim prospects for infusing the parade committee with the fresh blood needed to ensure the event’s success for years to come. 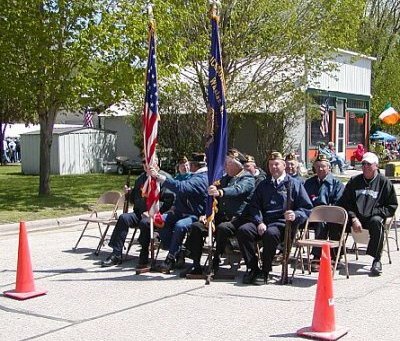 For the moment, though, residents aren’t concerned about the future, as the 2010 Stand Still Parade (to be held on Saturday, May 15 at 11 a.m.), seems poised to bring an overflow crowd to Whalan, which is located in southeast Minnesota just north of the Iowa border. Aside from the parade, the area’s main attractions are the scenic bluffs and 60-mile Root River State Bike Trail, as well as complementary tourist-oriented businesses like guest houses and campgrounds. For its part, the adjacent town of Lanesboro (which bills itself as the “Bed and Breakfast Capital of Minnesota”), offers live theater, Amish tours and horse-drawn carriage rides. But for one day a year the region’s focus is squarely on the Stand Still Parade, which typically features the Whalan Fire Department fire cart (1869) and antique cars, though the 2010 event will also include a special guest—a bald eagle from the National Eagle Center in Wabasha, Minnesota. The celebration won’t be limited to the parade, however. Organizers have events planned all day, including a cow-milking contest, pie-eating contest, bed race, and dozens of arts & crafts-type demonstrations, such as wood carving, fishing pole making and egg painting. But according to Tammy Hughes, 45, who owns Whalan’s Gator Greens mini golf course and rents a guest house called the Cyclin Inn, the most favored attraction is the food. “The food that everyone comes for is Lefse,” she says, speaking of the Norwegian flatbread, which reliably generates long lines of customers. Other treats for sale include hot turkey sandwiches, brats and rhubarb, with all proceeds going to the Whalan Lutheran Church. As for the inclusion of Stan’s Still (advertised as “a working moonshine still”), Hughes questions whether the still actually works, emphasizing that the sale and consumption of alcohol would be out of character for the festivities.